Gold dipped modestly Friday, breaking away from a four-session winning streak. But the yellow metal still advanced $50, or 3.2%, for the week, scoring its best weekly pick-up since early December. "Gold came under pressure because people are a bit more comfortable with the recovery of the economy, but it is going to remain rangebound until we get some significant news to push it into either direction," Reuters quoted Fred Schoenstein, metals trader at Heraeus Precious Metals Management. Gold prices edged down $3.30, or 0.2%, to $1,616.80 an ounce in the February futures contract on the Comex in New York. Gold prices moved from an intraday low of $1,609.00 to a high of $1,632.30. 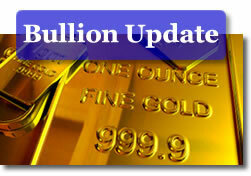 "Gold went up after a lot of year-end liquidation last week. Money managers have to put their (gold) position back if they want to have it in their portfolio to show it to their clients," said Schoenstein. Gold advanced 10.2% in 2011 for its 11th straight annual gain, yet fell in the final week of the year. At that time, expectations for this week were mixed, with precious metals surveys in varying directions. Forecasts for gold prices next week are mixed as well. The weekly Kitco News survey has a very slight majority of its participants bearish. "Worries about Europe will dominate headlines and that could weigh on (gold) prices as traders return to the dollar as a safe haven. The dollar was the preferred safe haven when worries about Europe were raised and the dollar strength has been a weight on the market. A Bloomberg survey is bullish as 10 of 22 surveyed expect gold prices to gain next week. Five were neutral. On Friday, silver prices for March delivery declined 61.3 cents, or 2.1%, to $28.683 an ounce. Prices ranged from a low of $28.57 to a high of $29.46. The white metal advanced 2.8% on the week after ending 2011 with a 9.8% loss. Platinum prices for April delivery fell $9.80, or 0.7%, to $1,408.20 an ounce, trading between $1,401.10 and $1,423.90. Platinum gained 0.2% on the week after falling 21.0% in 2011. Palladium prices for March delivery plunged $30.40, or 4.7%, to $614.00 an ounce, ranging from $612.05 to $642.55. The PGM metal plummeted 6.4% in the first week of 2012 after declining 18.3% last year. Palladium was the only precious metal to decline on the week, down 0.6%. Weekly increases included silver at 4.3%, gold at 2.7% and platinum at 2.1%. American Silver Eagle bullion coins were just as impressive. U.S. Mint AP’s ordered 3,547,000 during the first week of the year, an amount that has not been that high since September and a level that is already stronger than eight distinct monthly totals from 2011. Sales of bullion coins are generally strong in January as the new-dated issues launch. This year’s 2012 Eagles were released January 3. All bullion coin totals in the above tables are in the number of coins sold, not the amount of ounces. The United States Mint does not provide daily sales for its 5-ounce silver coins — the latest 5-ounce figures are current as of Tuesday, January 3, 2012.